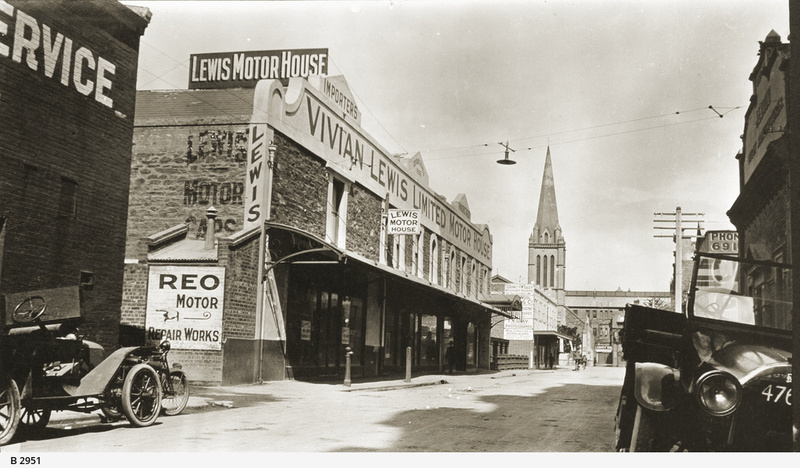 Gawler Place, Adelaide, east side, on the 22nd September, 1925, showing Vivian Lewis Limited Motor House. Early model cars are parked outside. The spire of St Andrew's Presbyterian Church can be seen in the centre. For a photo of this building (and the building erected in 1926 on the far side of Lewis' in 1952), see B 12361. The near side of Lewis' premises is 35 yards south of Flinders Street, and its frontage is 47 yards.